This Sunday, four of the world’s top tennis players will battle it out in the finals of the 107th Australian Open. This year’s event has been dubbed the “tournament of records” by many, and has set the stage for myriad memorable moments. It’s also been an important year for one of the Grand Slam’s partners, which has shown its support for years now: Lavazza. The Italian coffee giant has decided to continue growing its presence in Australia by entrusting the roasting of its beans to local companies. It’s a move that reflects both Melbourne’s “Third Wave” coffee culture – that focuses on origins, craft and quality – and Lavazza’s desire to learn more about the markets in which it operates. 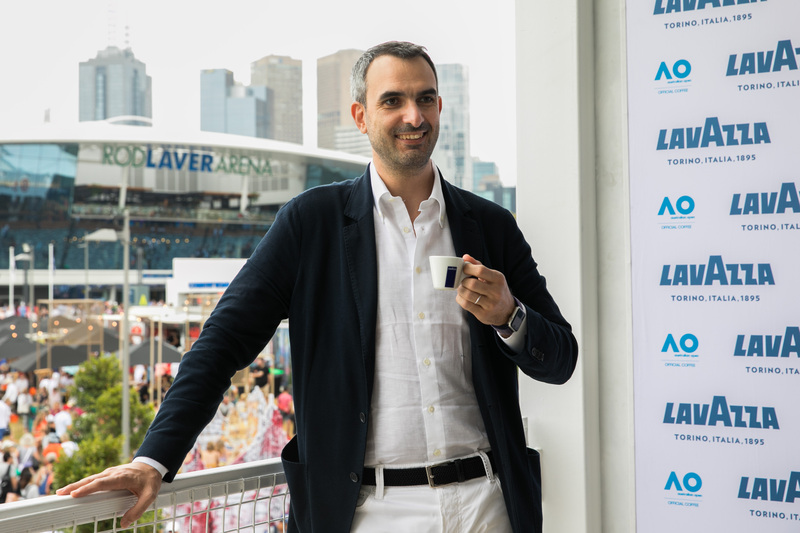 Speaking with us at the Australian Open, the company’s vice president, Marco Lavazza, explained how he learned about the concept of “roundness” here in Australia. In this particular case, “roundness” refers to the ability to consume coffee in different ways, including using it in the various stages of cooking, from preparing meals to concocting cocktails. Marco added that our country is “a melting pot of many different nationalities and with many different cultural influences”, which has led us to develop a “startling curiosity in regards to the world of food” and an interest in trying new flavours and cuisines. Despite Lavazza’s 124-year history and its respect for preserving tradition, Marco believes Australia doesn’t present a threat to the company, but rather an “opportunity for us to experiment and learn new things”. “During our first year of collaboration with the Australian Open, it was an extremely hot summer,” Marco recalled. “A steaming cup of coffee isn’t exactly what you want on a 42-degree day. In line with this philosophy, Lavazza has worked with one of Australia’s most innovative chefs, Italo-Scotsman Jock Zonfrillo, during the Australian Open. Celebrated for using native Australian products in his award-winning dishes, such as finger lime and green ants, Zonfrillo created a menu for Lavazza which respects his values while showcasing the real hero: coffee. “Collaborating with people like Zonfrillo, who are trying to bring back a tradition or to keep one going, much like us, is the perfect arrangement for Lavazza,” Marco said. To conclude, Marco explained that Lavazza’s relationship with tennis began in 2011, when the company partnered with Wimbledon. “The world of tennis is one that we like and with which we have many things in common: tradition, innovation, passion and strength,” he said. This is the fourth year Lavazza has partnered with the Australian Open, and the company is the only official partner of all four Grand Slams. Alongside sport, art is another area that interests Lavazza and in recent years, the company has worked with important galleries across the globe. Among these is the National Gallery of Victoria (NGV), which began collaborating with Lavazza just a few weeks ago. This story appeared in the Thursday January 24, 2019 edition of Il Globo. Lisa Basso is a journalist at Il Globo, specialising in stories based on community, arts and culture. The world of tennis is one that we like and with which we have many things in common: tradition, innovation, passion and strength.